Owning a motorbike comes with great responsibility and extreme freedom at the same time. You’ll get to ride to the roads you choose, whenever you choose and live your life just like you want to. However, staying safe should always be your number one concern, regardless of the type of vehicle you are riding. Thus, we believe you should definitely own and use a good pair of Harley Davidson gloves to keep your hands protected at all times. So, after going through plenty of online product reviews ourselves, we have reached the conclusion that one of the best pairs of gloves for you would be the new Harley-Davidson 98263-07VM because they are perfect for larger hands, feature an adjustable hook and a loop wrist closure, and come with an ergonomic thumb feature for increased mobility. If the Harley Davidson 98263-07VM is not available for purchase right away, the Harley-Davidson 98325-15VM would be a great fit. If you are a powerful man with big hands, you will appreciate this pair of motorcycle gloves which are sold in an XL size. They are made of linen stretch nylon and come with power-stretch around the knuckles. These items offer increased flexibility, as well as protection and comfort while riding. Moreover, the gloves have pre-curved fingers with an ergonomic thumb increasing your mobility and allowing you to reach the functions easier. This item might not come cheap, but it is really appreciated by owners. Enjoy long-distance rides with these comfortable pair of gloves. For a real biker, investing in comfortable and durable motorcycle gloves is certainly worth it. With this pair, you will be able to avoid unwanted friction but also excessive moisture. All of this, thanks to the high-quality leather! This particular model is made from cowhide leather and contains a tricot lining for softness, extra fit, and comfort. 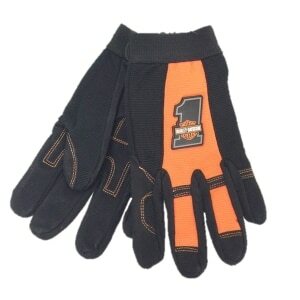 The gloves are equipped with ergonomic thumbs and rolled tip fingers. If not handled correctly, the stitching at the tips and along the fingers can break. Durable, comfortable, and luxurious, as well, these gloves are worth your attention. This pair is designed for female riders and offers hand protection during long-distance riding. The gloves are made of genuine, soft leather and also feature a Thinsulate liner and fleece cuff which will make them stay perfectly on your hands. They will also protect your hands no matter what weather conditions you might encounter on your adventures. The pre-curved fingers offer increased mobility while riding. Also, your hands will not feel any fatigue while on the road. For some prospective buyers, the cost might not be the most attractive feature. If you need durable, high-quality gloves during your rides, check this pair out! Harley Davidson is a reputed brand known for manufacturing top-quality bikes and all accessories required for you to enjoy your ride. But, since there are so many good Harley Davidson gloves on the market, we figured we should help you out a little bit by showcasing some of the most critically acclaimed ones, according to other customers’ reviews. This product is sold in an XL size to match the hands of strong and powerful men. These gloves are made of lined stretch nylon mesh and also come with power-stretch around the knuckles to provide maximum flexibility, comfort, and protection while riding your bike. What we also like about these gloves are the pre-curved fingers with a featured ergonomic thumb which will certainly come in handy, especially during long distances. The ergonomic thumb has the ability to increase your mobility and help you reach out your bike’s functions easier, without distracting you or having to keep your eyes out of the road. The adjustable hook and loop wrist closures allow for a perfect and comfortable fit regardless of the shape of your hand. For a proper fit, we suggest purchasing a size that is slightly bigger than your palm and fingers to allow some freedom of movement. Last but not least, this item also benefits from the reputed shield logo graphic, as well as from a rubberized bar. 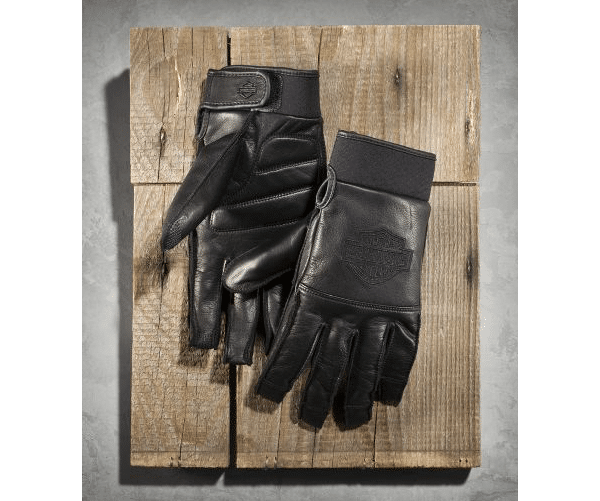 If you’re looking to invest in a comfortable, durable, and luxurious pair of leather gloves, this item from Harley-Davidson is definitely worth your consideration. Feel like a true biker and avoid any unwanted friction and excessive moisture thanks to the upper-quality leather these gloves are made of. They are made of cowhide leather and contain a tricot lining for extra fit, softness, and comfort while still remaining durable and strong enough to endure high speeds and different weather conditions. 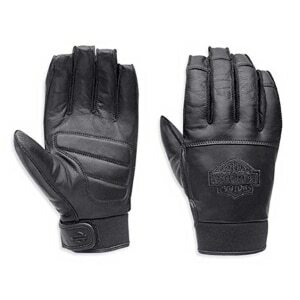 The product is also equipped with an ergonomic thumb and rolled tip fingers for the same touch of comfort and luxury all the Harley-Davidson items offer. What we liked the most about this particular set of gloves are the pre-curved fingers that are specifically designed to reduce hand fatigue in time, meaning you’ll be able to ride on long distances without feeling tired. Also, the neoprene cuff will absorb all excessive moist for added comfort while the adjustable closure will ensure a tight fit for your hand. Who said that women cannot ride a powerful Harley-Davidson bike just like men do? This pair of women’s leather gloves will keep your hands protected at all costs and help you ride your bike for prolonged hours without hand fatigue or excessive moisture stopping you. The gloves are made of genuine and soft leather and feature a Thinsulate liner and fleece cuff to not only stand perfectly on your hands but also to protect you from harsh weather conditions such as strong rain or wind. The padded palms are specifically designed to reduce fatigue while riding so you can enjoy multiple hours on your bike without feeling like you should take a break. The gloves also feature pre-curved fingers with ergonomic thumbs for increased mobility while riding. 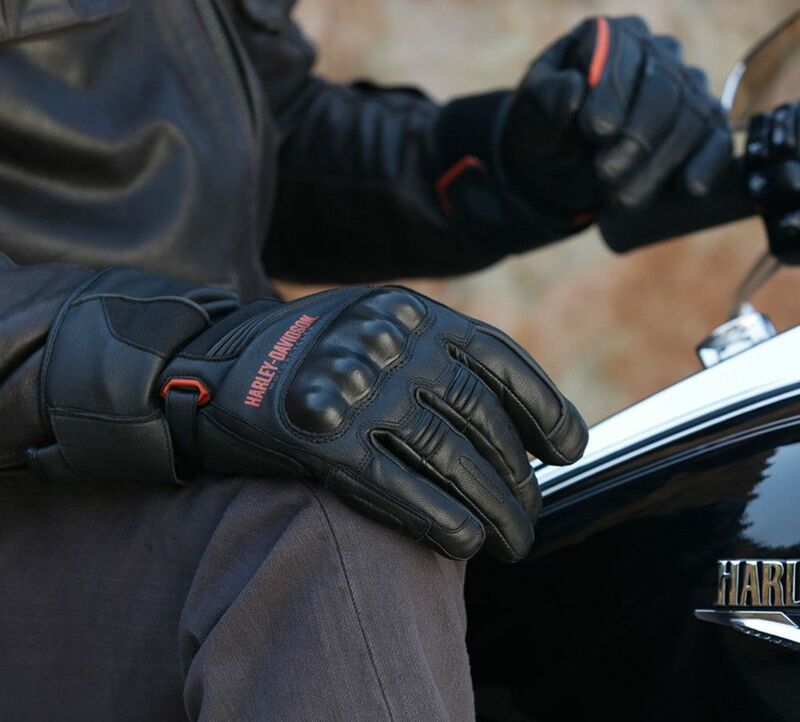 Moreover, you will benefit from the classic Harley-Davidson logo and graphics which are embroidered to this pair of exquisite leather riding gloves. This is another pair of amazing genuine leather gloves sold by the Harley-Davidson brand. The gloves are equipped with wind-resistant Thermolite insulation for improved warmth without adding any extra weight to the design. Thus, the gloves remain ultra lightweight and easy and comfortable to wear in all weather conditions, be it sun, rain or wind. The ergonomic thumb and the pre-curved fingers will help you enjoy a smooth riding experience without experiencing any hand fatigue even after long hours of riding. This way you can enjoy riding your favorite and powerful bike to your destination without having to stop too often to rest your hands. The gloves come with an elastic wrist and an adjustable closure to ensure a tight, secure, and perfect fit, regardless the size of your hands. In addition, the elastic wristband will also properly insulate your hands and provide extra warmth while wearing the gloves. The item will mold perfectly to your hands. The item comes in two different sizes – Small and Medium and is perfect for shorter-handed people or those with slim hands and palms. For the perfect fit, we advise you to check the size chart and compare the dimensions of the gloves with the dimensions of your own hands. Keep in mind that a good pair of gloves should fit perfectly both in length and in width, especially around your wrist. This pair of gloves is made of 100% genuine cowhide leather and features a tricot lining for a safe, soft, and timeless design. The product also comes with an outstanding waterproof design on the outside to make sure you ride safely in all weather conditions. These gloves feature ergonomic thumbs, and 45-degree pre-curved fingers, as well as gel-padded palms for increased comfort, durability, and stability while reading. The elastic wrist comes with a leather roller buckle wrist strap to provide a comfortable and close fit to your hands so you can enjoy endless hours of riding your bike without having to worry about your safety equipment. This pair of gloves is made of waterproof genuine leather and features insulated tricot lining for extra warmth without adding any more weight. As a result, you will benefit from a lightweight design that molds perfectly onto your wrist and palm, providing maximum comfort and protection while riding your bike. Some of the main features provided by these gloves include an ergonomic thumb and pre-curved fingers for even more comfort while riding. This way you can enjoy endless hours of riding without having to stop to rest your hands or stretch your fingers. Moreover, the power-stretch knuckles add improved mobility so you can ride safely while enhancing the fit. The anti-slip grip will help you keep your hands closely on your bike while the cuff closure is adjustable for providing the perfect fit. This pair of gloves is sold in a 3XL size so make sure to measure your hands correctly before ordering the gloves. This product was specifically designed to keep your hands clean and safe from unwanted abrasions and wear-offs. The gloves are made of top-quality polyester and feature orange stitchings, as well as an orange racing stripe design for added comfort and style whenever you’re riding your bike. This item comes at an XL size so make sure to search for the sizing chart and compare it with your own hand measurements to ensure a close and comfortable fit. What we also liked about this product is the molded rubber patch that provides a comfortable fit and helps you reduce friction and abrasion even after long hours of riding. 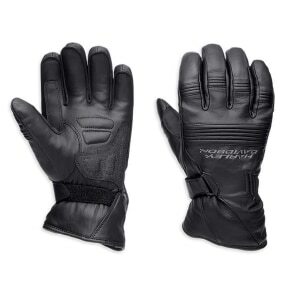 The item is sold for a very convenient price given the Harley-Davidson legacy so if you’re looking for a branded pair of gloves without investing too much, you should definitely give this particular product a try. Most of the customers who purchased the gloves were pleased with their acquisition. Make sure to measure your hands accordingly to get the right size and fit for you. Finding the right pair of motorcycle gloves could give you quite a headache, especially since there are countless good designs available for sale nowadays. However, if you want to stay safe and be cool at the same time, you will certainly opt for the best Harley Davidson gloves to match the rest of your riding gear and motorcycle. Depending on what you choose, a pair of Harley Davidson riding gloves should cost you up to one hundred but rest assured these will not only keep you safe while riding but will also last you many years from now on. So, if you’re looking to find a good pair of Harley Davidson motorcycle gloves, here is what you should take into account. Whether you opt for the Harley Davidson gauntlet gloves or a more timeless design, sizing and fitting are extremely important. Keep in mind that these riding gloves also come in different sizes, so you need to make sure you’ve purchased the right one for you. There are plenty of free online tutorials that can teach you how to correctly measure your hands in order to determine the right size for your gloves. 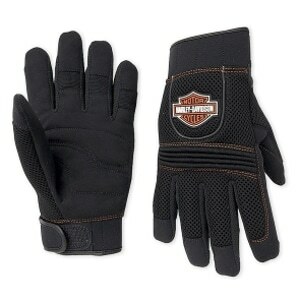 So, make sure you go through some reviews of Harley Davidson gloves and read everything about the perfect size for you. You should also compare your size with the one provided by the manufacturer to ensure a perfect fit. Keep in mind that the gloves should fully cover your hands and stay tight to your hands to ensure a good fit. Most of these gloves do come with adjustable buckles or Velcro closures so unless you have really thick hands, they should fit great. Also, bear in mind that not all types of gloves are stocked in all sizes so if you wear extreme sizes like extra small or extra large, it may be best to first check the availability of these sizes for your favorite pair of Harley gloves. Another thing to take into account when shopping for your bike gloves is to make sure they are specifically targeted for your gender. 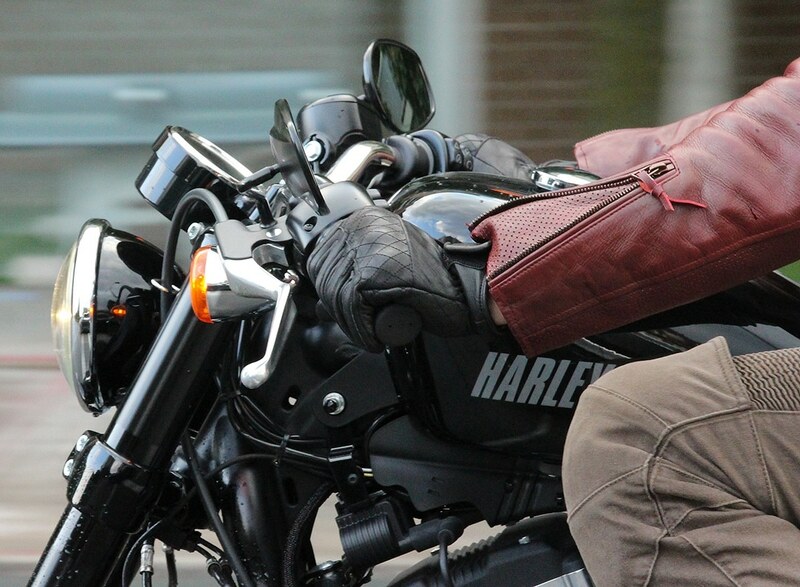 Usually, men and women have different sizes, shapes, and lengths of hands, with most women’s Harley Davidson fingerless gloves being significantly thinner and shorter than the ones for men. Check the label and the description of the product carefully before purchasing the pair of gloves to want to make sure it fits correctly and is according to your needs in the traffic when riding your motorcycle. One of the most important features to consider when shopping for motorcycle gloves is a lightweight and comfortable design. No matter the choice of the material, a good pair of gloves should fit like a second skin, perfectly molding on your hand while also providing you maximum coverage and protection against harsh weather conditions and heavy winds. The gloves should come with an aerodynamic form and an ultra-lightweight design to provide maximum flexibility and freedom of movement while riding. Under any circumstances, these gloves should be rigid or heavy as they will only add extra pressure to your hands and cause fatigue in the long run. There are different types of materials you can opt for when choosing a pair of good riding gloves, and it all depends on your requirements, budget, and type of riding you prefer. 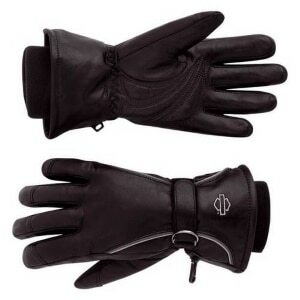 If you like riding at high speeds, you will definitely require a pair of full gloves made of soft yet comfortable fabrics that will keep your hands warm and safe from wind and water. Leather is one of the most common fabrics for manufacturing riding gloves but a good pair of Harley Davidson leather gloves won’t come cheap. Most of these items are made of 100% genuine leather of top quality and feature tricot linings and stitches for adding extra warmth to them. They are usually preferred by experimented drivers who enjoy riding at high speeds and spending lots of hours on your wheels, riding all across the country. 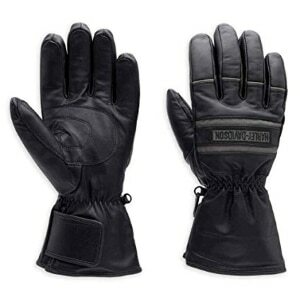 Other preferred fabrics for manufacturing motorcycle gloves include polyester fibers and mesh inserts. These are often used during the summer when you need a pair of gloves that keep your palm and fingers protected while also absorbing the extra moisture and allowing your hands to properly breathe. Keep in mind that good ventilation should be offered by all gloves, regardless of their design, size, fit, brand, quality, and material. The safety of your hands and head are the most important when opting for protective motorcycle gear, so never cut on safety in favor of design of price. If you’re looking for a durable pair of gloves that you can use regardless of the weather conditions outside, make sure to opt for Harley Davidson waterproof gloves. Not all riding gloves are waterproof so you need to pay close attention to the product description and see whether or not they are waterproof. A waterproof design means that your hands will stay protected no matter how much you sweat on the inside or how much is pouring outside. In addition, they will prevent your hands from slipping and provide a safe and comfortable riding. Waterproof gloves can be made of both polyester fiber blends or leather, so it is really up to you to pick the right fit for your type of bike riding. We do suggest opting for waterproof leather gloves because they are thicker yet soft, comfortable, and warm, so you won’t require different pairs of gloves during the winter and summer season. What parts are a motorcycle glove made of? Motorcycle gloves are made to protect your hands against all weather conditions, as well as friction and excessive moisture so you can keep your hands dry while riding. They are extremely useful and indispensable whenever riding your bike, so you need to pay close attention when picking the right pair of you. Although they come in numerous sizes, shapes, colors, designs, and materials, most motorcycle gloves are made of the same number of parts, each of them equally important for your safety and protection. Here are the most important parts you need to be aware of in your motorcycle gloves. The upper part is the most visible one and represents the portion of the material that covers the back and top of your hand. It should be thick and tough enough to protect you from all potential hazards and crashes, but should also be able to save you from rocks or bugs that might come your way when riding. The upper part is specifically designed to keep your knuckles safe and away from any form of impact or hurting. 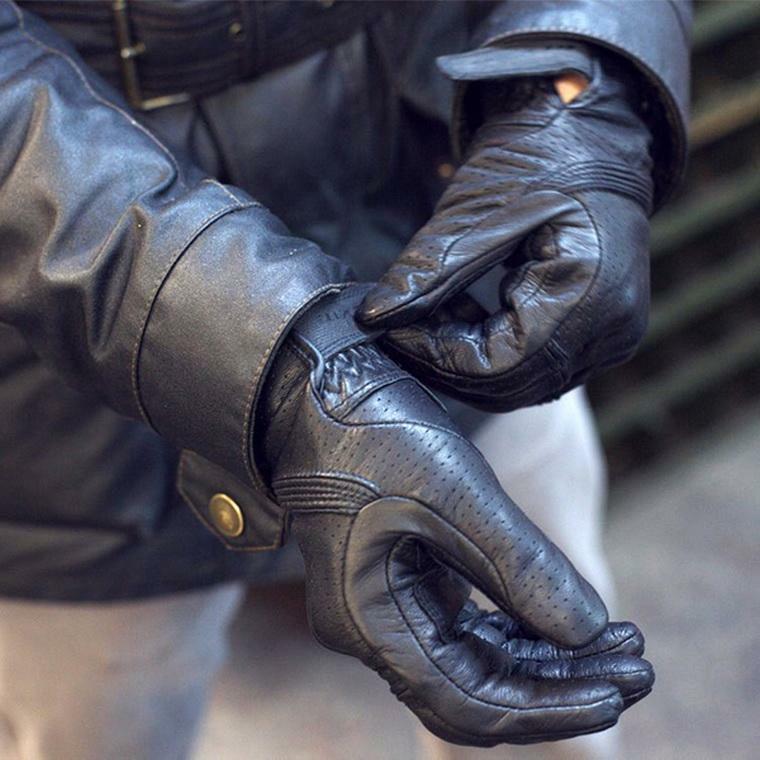 The next part of your motorcycle gloves is called the fourchette and it usually represents the strip of fabric connecting the upper part of your gloves to the palm, and in between your fingers. This part is most of the time extremely well ventilated to allow air circulation and keep you away from excessive moisture that might mess with your riding skills. Following the fourchettes, we have the palms which are often made of a thinner layer of fabric than the upper part and provides a more comfortable touch. The palms of your gloves are also the ones getting in contact with the throttle, so it should be soft enough to allow you to conveniently ride anytime. If you’re opting for a leather pair of gloves you should expect the palm of your gloves to be made of soft leather, usually goatskin or kangaroo skin. Another extremely important part of your gloves is represented by the lining. It is designed to enhance the inner comfort but its performances will vary, depending on the type of glove you are purchasing. For instance, some of the linings will provide proper ventilation while others, made of tricot, are designed to provide extra warmth to the ensemble. Other types of lining will provide a waterproof design too. Cuffs are also important as they provide a protective barrier to your wrists and keeps them away from cold and excessive moisture. Most of the times these cuffs come with protective elements specifically designed for the safety of your wrists, including paddings and armor. In terms of closure, we reckon that it should be strong enough to keep your gloves tight and secure especially in the long term in order to keep you safe from unfortunate events or crashes. Closures could come in various forms, including Velcro closures, buttons, hook-and-loop designs, D-ring straps, and others. The stitching is different from the lining and often enough it is one of the most underrated parts of a pair of gloves. However, it is highly important that your glove stitches are strong and well made to provide a long-lasting design that will meet all your riding requirements and standards over the years. If you’re not willing to change your pair of gloves every year, make sure to purchase a quality pair with strong stitches made of durable fabrics, preferably Kevlar. Does Harley Davidson make these gloves or some other brand? There are countless types of biking gloves so you need to find the right pair for you and your riding requirements. If you’re opting for a pair of Harley Davidson gloves, you can rest assured these are made by the company and not subcontracted to other factories or companies that are designing and putting them together. This means that you can purchase a pair of genuine Harley Davidson gloves from any original shop or licensed vendors across the world and you will benefit from all the company’s name, design, quality, and everything else. Are all Harley Davidson gloves waterproof? Unfortunately, not all the Harley gloves are made with waterproof linings and exteriors, so you need to pay close attention to the product you are buying. It would be best to read some online reviews about the product prior to you purchasing it to see exactly what other customers have to say. In addition, make sure to carefully read the product’s description and search for the waterproof qualities of your gloves. If the product of your choice doesn’t clearly state it is waterproof, then you should probably opt for another one that meets these standards. What type of glove do I need? 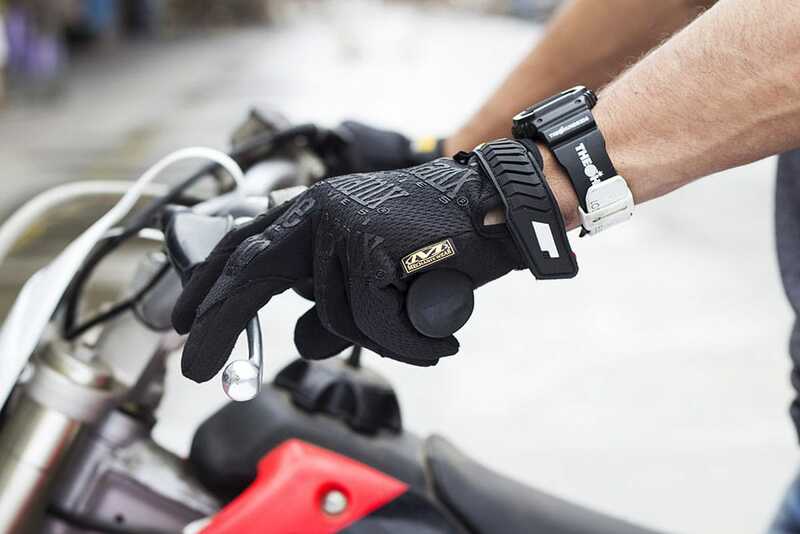 There are numerous types of motorcycle gloves, so you’ll have to opt for the one that best matches your style of riding, as well as your passion for this sport. Regardless of the type of gloves you choose, make sure they are made of top-quality materials with strong stitches and a durable exterior. If you plan on riding during the summer, you may opt for fingerless designs that allow increased ventilation to keep your hands and fingers dry when riding. If, on the contrary, you plan on riding your bike year-round, including during the rainy season, make sure to opt for a waterproof pair with tricot linings for extra warmth. How much should a pair cost? 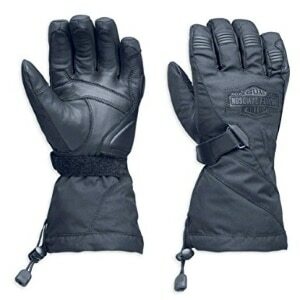 The cost of a pair of Harley Davidson motorcycle gloves depends on the model, material, size, and other features. Gloves made of polyester and mesh blends are usually cheaper as they don’t come with extraordinary features and they are mainly suitable for short rides during the summer. However, if you’re willing to invest in a high-quality pair, you should definitely opt for leather Harley gloves. Depending on their size, quality, and type of leather used, these gloves should could cost you anywhere between 50 and 100 dollars, but some are pricier.